I had a surgical procedure this past Monday, and took the entire week off from work to recuperate. Which means, of course, that by Tuesday afternoon, I was completely bored out of my gourd. I was only able to be a dutiful patient until Wednesday at noon, when I met a friend for lunch, then later drove to get frozen yogurt, and even later, met my husband for dinner. While these outings did somewhat alleviate my “stir-craziness,” I spent the rest of the night hugging a heating pad and re-acquainting myself with my friend Vicodin. But Thursday — Thursday was a completely different day altogether! Thanks to the Vicodin, I awoke to find a day of possibility! I did force myself to stay on the couch until noon, but here is the problem with daytime television: it makes me think I can do things, all kinds of things in fact. For example, after watching a reality show about a bridal salon, I can totally picture myself opening one — I mean, how hard could it be? Then I watched a woman construct a $1,300 birthday cake for a three-year-old’s party. Awesome! I could totally do that… just a quick run to Williams Sonoma and Whole Foods for the appropriate tools, and I’m in business. (In this respect, I am incredibly fortunate to have an extremely practical and level-headed husband). But the channel that finally did me in was of course the Food Network. By noon on Thursday, I had come up with the brilliant idea that I wanted, no needed, to cook clams for my husband. This was in part because it was infinitely more practical than opening a bridal salon, and also because he had been very stressed at work (not to mention that he survived with commendable grace the hormone tsunami that ravaged our house the week prior…). And what better way, really, to recover from surgery than to teach yourself how to cook clams? 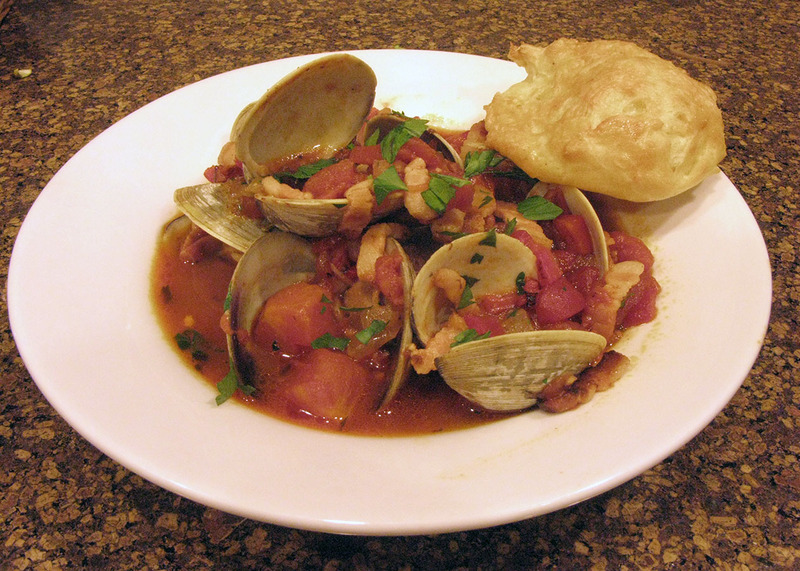 Being from Long Island, New York, my husband is in love with seafood — especially things with shells. Crabs, Lobsters, Mussels, Clams, you name it. If it has a shell, he’s drooling over it in the pages of Bon Apetit or Food and Wine Magazine the way some men drool over Hustler. My experience in cooking anything with a shell is limited to staring at them in the case at Whole Foods, a little freaked out that they are still alive in the ice, and imagining whether you can hear a tiny clam scream as they are thrown into the pot. In my head, it’s something like a high-pitched “eeeeeeeeeeeee!” (My husband assures me this is not the case). I also decided to make Gruyere Gougeres, a French recipe for a savory sort of cheese puff pastry/roll. Baking I can do, so if the clams were terrible, at least we could gorge ourselves on Gougeres and beer. After a quick trip to Whole Foods (I tried to block out the noises the different kinds of seafood make when they scream- did I mention I have an over-active imagination?) I came home and Googled “how to prepare clams.” There were all kinds of suggestions, from soaking them in actual seawater so they would purge their sand, to doing nothing more than shucking them and swallowing them raw. I finally settled on scrubbing the outside and putting them in the fridge covered with a wet dish rag until dinner. I do admit that I tried to open the fridge as little as possible that afternoon due to feelings of guilt — poor little guys knew that now that they were scrubbed, it was only a matter of time until the giant boiling pot…. Then it was dinner time. After sauteeing some applewood-smoked bacon, onions and garlic in a large pot, I added two cans of diced tomatoes and some chopped roasted red peppers. I brought it to a boil, and then it was time for the clams. I took the clams out of the fridge and as fast as I could, dumped them in the pot, slammed the lid on, and ran out of the kitchen, just in case there really were any audible clam-screams from the pot. About ten minutes later, I ventured back in and lifted the lid, and there they were– all beautifully open and simmering in the sauce. Is there really any better smell than a sauce full of garlic and onions simmering away? It is truly a salve for the soul. Now, I must admit that immediately after eating dinner, I once again was forced to lay on the couch with a heating pad for the rest of the night. But the look on my husband’s face when he came home and found clams for dinner made it completely worth it.